Inspired by linen and lace, this beautiful, delicate white lace design is accented with a faux bow and is set against a linen textured effect background. The popular aged, vintage look and background are part of the design. 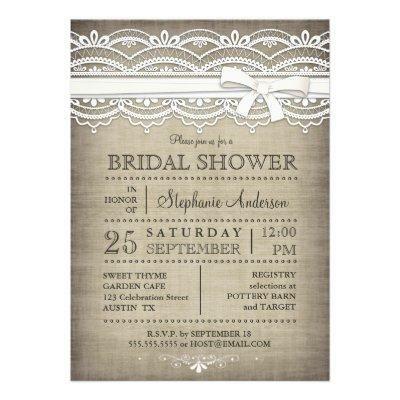 A lovely, casual and elegant Bridal Shower invitation suitable for a country bride or a rustic or vintage themed wedding. Also available with white text.